Clothes Are Your Second Skin. Take Care of Them. Maybe you’ve bought something new and you just can’t wait to wear it, but it’s got this weird chemical smell that triggers your allergies and sensitivities. (Or it came from a thrift shop and the previous owner used a heavily scented perfume). Or maybe your trips to the laundromat feel like a game of Russian Roulette because you just never know who used the washing machine before you, and you’re scared of cross-contaminating your clothes with something gross. Either way, it’s all okay. None of these situations have to be stressful. 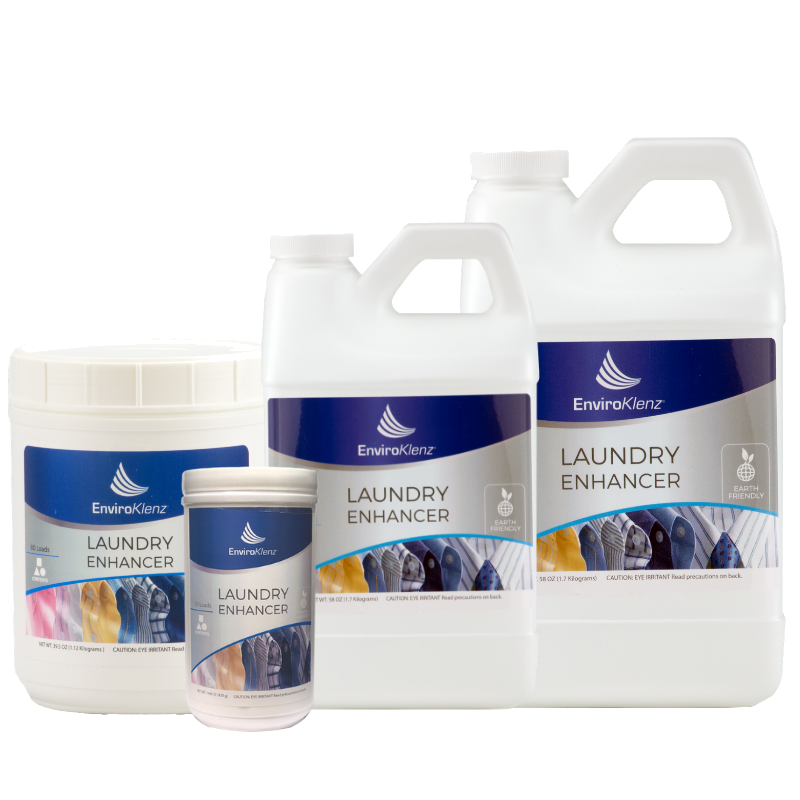 Because when you add a dose of our laundry enhancer to your wash cycle, our earth mineral technology safely neutralizes any odors left in the clothing or the machines themselves, meaning you can wash and wear your clothes without any worry of activating your allergies or sensitivities. ✘ Overloaded wash cycles. Over loading the wash machine makes it difficult for the product to work properly. The level of contamination may be too much for the recommended dosage and the product may not be able to fully contact all the odor sources in the wash.
Not only does everything smell better when using EnviroKlenz, the items seem to be softer also. This is a very good product. Was a little skeptical about the claims of this product but decided to give it a try anyway. Could not believe the results. It does an amazing job. I did have to apply two applications on some tough spots but in most cases, one application cleared up the spot/mess. A product to use in fighting the increasingly persistent results of a criminal industry trying to make fabrics give off poisonous fumes forever no matter what. Excuse me for wanting to breathe. This has saved me countless headaches from odors and perfume. This is an amazing product! You ever notice an “old people” odor? Turns out it’s an enzyme we all secrete and simply do it more as we age or workout. Tried double washing, extra OxyClean, double dryer sheets, nothing worked. Doubled up on EnviroKlenz as they recommended for strong odors, which were on the bed sheets and blanket. Before the entire laundry room would have that “smell” in the air but after this first load it never did again. The blanket had a hint of it if you stuffed your face in it, which i’m sure is due to the thickness of the material and will be undetectable after it’s next washing. For B.O., old or young, BUY THIS!!! The laundry enhancer is great. I bought it for my daughter after I bought it the first time because I like it so much. Laundry product helped but did not totally eliminate fragrance from used clothing, especially with stretchy fabrics or jeans with one wash.
pretty good stuff with the new front loaders works on towels!! Takes the sweat smell right out! I love this stuff!!! This product came highly recommended, and was delivered in record time. I feel confident it is as environmentally friendly as advertised, and that it would work well on organic odors [such as pet and mildew] but it was not able to neutralize a horrible fragrance from a stain remover stick applied to a synthetic hiking pant enough to be able to continue to wear the garment, after multiple applications. I will buy again to have on hand for general laundry use. It works sometimes but not always in the first wash. I will buy it again because it is the best one so far that I have purchased to help get the fragrances out my clothes. This product seems to work. My son has multiple chemical sensitivity and adding this to his new clothing has lessened his reaction to dyes and sizing that usually takes several washes to resolve. I had a set of scrubs that had a smell of mold that I could not get out. I had tried vinegar and borax. One tablespoon of enviroklenz and voila – fresh as ever. I will probably use this at least a drop every load of laundry. I purchased a pair of black jeans, they were made in China who use formaldehyde to deter bugs and for color retention – they stunk to the high heavens. I really liked the jeans, wanted to keep them so I needed something to get the smell out or I could not wear them. I used the EnviroKlenz 4 times and each time it got better but, even this product as great as it is could not get all of it – seems this odor is ingrained in the fabric, if that is the case…nothing will help. I will be sending the jeans back. This doesn’t mean that your product won’t work, it did help, a lot. I soaked my clothes twice to get the chemical smell out, it did take out the smells! Nothing worse then wearing smelly toxic chemicals. Thank you! 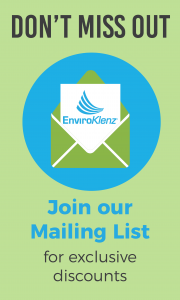 I am thrilled that I wrote to EnviroKlenz and they provided me with some helpful tips after I tried the product without any luck. I had too many clothes in the washer. I took half of them out and tried again with double the agitation and an extra rinse and it worked great! Took out the perfume smell from the hand me downs laundry detergent! I’m going to be a customer for life now! Nice to have when you have new clothes and need to detox them. Kyle from EnviroKlenz is very nice and knowledgable and full of good information to guide you in using the product. So happy to know there are things like this for people with Chemical Sensitivities. 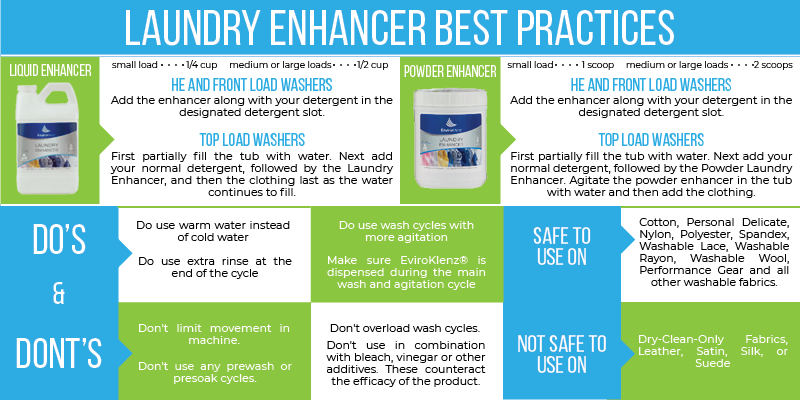 EnviroKlenz Laundry Enhancer is a most valuable product for those who are chemically sensitive. With this product I have been able to purchase new clothing without having to wash it up to 20 times before it can live in my home. I usually soak the garment for a few days in the EnviroKlenz, then wash it 4 times using my natural laundry soap and EnviroKlenz as recommended. This most often does the trick for me and I am so grateful to have this kind of help. What a great product for removing odors!!! I have used this product on several loads and it has worked great! First, I used 1/4 cup with my regular detergent to wash a load of stinky dog towels. The towels had been sitting for a bit so that I could have enough for a load before i ran it. That being said, they were pretty rank. This product took every bit of stink out of the towels and you would never know that they were used to dry off 2 very wet and dirty dogs. YAY! Next I added 1/4 cup to my bedding loads. The dogs sleep on the bed with us so by the end of the week our bedding is pretty bad. Again, this product removed all of the smell. Lastly, I have been using it to wash our regular clothing along with my husband’s work clothes. His job puts him outside all day with no air conditioning. We live in Austin, TX so it’s been very hot, humid, and rainy. At the end of the day, their is some serious stink going on with his clothes. Thankfully this product pulls through and completely removes all the funkiness that he brings home with him. This is a great product if you have smelly, stinky laundry! I do recommend that you shake the bottle a couple times before measuring out what you are going to use. It tends to separate a bit when it sits. The liquid is similar to white chalky. Followed instructions on label and it worked to remove an odor that had gotten into some work clothes, after nothing else had. A few items required using it twice, but most were good after one use. This stuff is amazing! Just by adding it to the fabric softener section of our washing machine, we have been able to get rid of the gross smell that we were getting in our clothes! We had a load that day in the washer too long and after washing the load with the liquid EnviroKlenz none of the items in the load smelled musty! Someone online recommended it for loads that vinegar used in the same fashion could not fix. I have fragrance allergy and use fragrance free laundry detergent. I also use a shared laundry room and everyone else seems to love laundry products that have very strong fragrance. Washers and dryers consistently smell of detergent fragrance which gets on my laundry and linens for up to a week. My old method of dealing with it was to run each load twice: first with detergent, then with a cup of vinegar which did not always work. 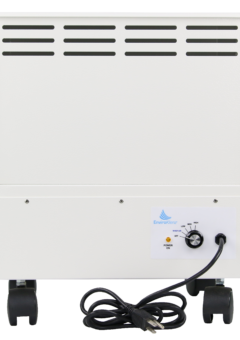 EnviroKlenz is a perfect solution for the washer part of my problem. I do have to use a generous amount: usually 4oz per laundromat style top loading machine or more for one particularly smelly type of detergent. But it does get the fragrance out completely. I was ready to throw it out, all of it – the bed sheets, the down comforter, the pillows, the pajamas – even the curtains! They had that stale, unwashed and overwarn stubborn scent, you know that musty scent that won’t come out with detergent alone?! Then I found LAUNDRY ENHANCER! It removes that odor perfectly. I even got a thumbs up from my husband! I wish I would have found this sooner! Now I use it for towels and baskets of clothes. I am quite happy to have found your product. For the first time in 3 years, I have been able to buy new clothing, wash & wear them after using your product. This did the job getting some overpowering perfumed detergent smell out of a load of clothes, although it took 3 washes to clear most of the odor from some plush loungewear. It seemed to linger in the elastic waistband area so I blame it on the garment rather than the washing product. Glad to have the product, though. These days it can be tricky buying things without annoying odors even when the labels say fragrance free. I love this product. I am very sensitive to chemicals on fabrics and this product really helps neutralize the chemical odor. EnviroKlenz saved me so much discomfort and headache. Also, if you buy directly from their site, they have amazing customer service. Expensive, but, it works. I am ultra hyper sensitive to laundry fragrances that linger in clothing. EnviroKlenz was a last ditch effort to rid the fragrance smell from a few items bought used. Used as directed on the bottle, EnviroKlenz works for clothing that has some mild odor. However, if you have serious hypersensitivies, and/or have something that is more than mildly odorful, put enough water in a bucket to cover all the affected clothing, add 1 cup of detergent and 1 cup of EnviroKlenze – stir well. Leave for a few days, stirring it every so often. The EnviroKlenze product works by coming into contact with the fabric fibers. I had to use the bucket method on two items – and I was amazed that it worked. I could wear the clothing without getting sick . I received my EnviroKlenz laundry enhancer in the mail the other day. I couldn’t wait to try it! Our clothes had been smelling musty for months, and nothing I did seemed to help. I even opened up my HE top loader washer, removed the drum and scrubbed the inside and outside of the whole machine. The musty smell was driving me crazy and making me feel almost sick. I tried the EnviroKlenz in one load of musty t-shirts and sports clothing the other day, and I could hardly believe it, but the clothes all came out of the washer and dryer smelling CLEAN and fresh! It blew my mind away. I will be washing all the rest of the family’s laundry tomorrow, and I will use the EnviroKlenz with each load, because many more articles of clothing are stinky, too. I am so excited your product works! The EnviroKlenz “liqud” 15 load fragrance free & non-toxic detergent arrived in a round canister. The first problem I noticed was that what I thought was a liquid, actually arrived in powder form. Powder is okay, its just not what i’m used to utilizing in my wash. Per the directions, I set the washer for the load that I was going to do and allowed it to begin filling with water. I went ahead and used my regular detergent, even though it prefers you use a detergent without fragrance. I put my detergent in the wash tub and then added a tablespoon of the product to the washer before adding the clothes. I decided to try the product on our socks, because let’s be honest, socks are about the smelliest laundry in most homes. Another drawback was that you cannot use the product in combination with bleach. I was hesitant with this step, because I was washing “white” socks. But I wanted to give the product a fair chance, so I didn’t use bleach. When the load was done, I was pleased that the product did remove the “foot odor” from the laundry and even a little of the fragrance from the detergent (which didn’t bother me). However, I was disappointed with the stains that still remained on the socks since I didn’t use bleach. I will continue to use the product, but will probably go back to bleaching the socks! We like to run around without shoes on a lot and our socks can get pretty dirty! UPDATE : I’m adding a star to my review (3 to 4) because after three more uses of the EnviroKlenz liquid on my towels, I have noticed a definite improvement in the smell. I didn’t change my use of the liquid, so I guess it just took time on my loads. I will definitely consider purchasing this at full price if it can keep my towels from smelling musty. I’ve tried this product on two smelly loads of laundry (musty towels) and I haven’t noticed any difference in the outcome of my loads. The EnviroKlenz has done no harm to my laundry or washing machine, so I’ve rated it an ‘OK’ product. It’s a milky liquid with a faint chalky smell, but not offensive in any way. I would consider it fragrance-free. There is no ingredient list on the bottle, but the product description says it’s made from various combinations of Magnesium Oxide (MgO), Zinc Oxide (ZnO), Titanium Dioxide (TiO2) as well as “water in our liquid based products to aid dispersal and contact with the chemical odor that needs to be neutralized, and Magnesium hydroxide in our liquid products (since MgO inherently converts to that in the presence of water). It would be nice to have an ingredient list on the packaging. This product is made in the USA. 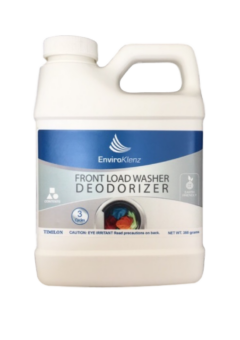 I used the EnviroKlenz in conjunction with my regular detergent – exactly as instructed – in my LG front loader, and my towels still have a faint musty smell after washing and drying . No change in the smell in my machine either, although it’s never been bad, just musty. This item shipped and arrived quickly as expected. It really seems to get odors out. I don’t have a front load wash machine, but I can see why people would want to use it on a regular basis to prevent odors that they can build up. HOLY AWESOME! I love this stuff. I had some towels that got left in the dryer and had that mildewy smell and it came right out. I also have special needs children who have potty issues at night and tend to get that urine smell in the blankets and stuff. And this stuff knocks the smell right out that regular detergents can’t do. I am beyond amazed. Really, don’t even need a whole lot for a load. Helped remove most of the smell of fabric softener from my jeans. But did not completely remove it. This is a must have in the House, I am sure that I am not alone here on laundry day sometimes Family members can forget to throw things in the dryer after washing and then you have musty, stinky smelling laundry and just rewashing them DOES NOT get rid of that smell, trust me I have tried, no matter how much fabric softener and good smelling additives I use the smell is still detectable and gross. This Laundry additive has no smell but what it does is target that left behind bacteria that is causing the odor and just stomps it out of the clothes, this also works super well for those who use perfume and colognes that can kind of hang around on the laundry, it will also remove that smell. Spilled some gas on my sweat pants when I was getting ready to mow and this stuff really works excellent it removed that smell from the pants in just one wash and I did wash them alone without other laundry to test this and I must say I am very impressed with the performance this Laundry Additive has, I highly recommend it for any laundry stinks that you can not get out with just washing, also works excellent at removing stinking animal smells from their bedding, my large Dog has 2 different XL bedding, and I just switch them out when I am going to wash the one I am currently letting her lay on I just throw done the cleaned one for her while I wash the other. I never could get rid of that doggy stink smell even using bleach, but this Additive knocked it right out of her bedding. First and fore most you really have to shake this stuff up before using it. I put it in with a load of dish towels that always smelt funky when you would be drying the dishes. Seems like it took the smell away but time will tell. I will continue to use it in my pets bedding and other items that might hold odor. I like that I can be used on all types of fabric and is fragrance free. This product is really good!! We have an elderly cat who chooses to urinate on all sorts of things including towels, any clothing left on the floor. e have dish clothes that, well, smell. We do not really know why, we use them, let them air dry before a load of laundry is done, but a lot of them still get a mildewy (is that a word?) smell. I wanted to try some of the major brand stuff, but my husband only wants to get more earth-friendly laundry detergent, so we have been suffering with the smells (not to mention that horrible smell when I wipe the table off!). When I saw this, I just about jumped on it! When it arrived in the mail, I had imagined the bottle to be bigger (I guess I need to pay more attention to product details…). There is not much smell to it and I had my doubts about it working on the dish clothes. When I went to try it out, the first thing that made me stop was that it did *not* come with a cup. That made me grumble… I had to go get one of my measuring cups I use for food! But, I used it. When the wash was done, I gave the load the sniff-test and they did not have any particular smell. So, they went into the dryer (without dryer sheets). I used one of the dish clothes to wash off counters and the table and there was still some smell. So, the next day I rewashed the whole load with another 1/4 cup. This time around there was no smell! I was pleasantly surprised. I went into my closet and got out some winter sweaters I got at the thrift store last year that had latent perfume smells from somebody else that I could not get rid of. I gave that load a 1/2 cup. Wow! The perfume smell is about all gone, I can only detect it if I really smash the sweater against my nose to detect a slight smell. So, I am happy with this product! My only thing against it is that it does not come with its own measuring cup… I will go to my dollar store and pick up something cheap.